The DA leader accuses the president of not being ‘in touch with reality’ with his Sona promises. DA leader Mmusi Maimane has written an opinion piece in The Sunday Times slamming President Cyril Ramaphosa’s second State of the Nation address (Sona), saying the president made promises that show he is “not in touch with reality”. Maimane said promising schoolchildren who “can hardly read” expensive tablets is like “promising fancy running shoes to someone in a wheelchair”. He also said the president should not be talking about a fourth industrial revolution is unrealistic when “10 million South Africans are unemployed and largely unemployable thanks to our broken basic education system”. Another promise Maimane finds unrealistic is Ramaphosa’s commitment to providing a complex National Health Insurance system. The government hasn’t even got the “pilot right” and should not be trying to nationalise health care when it “can’t fix our public clinics and hospitals”, according to the DA leader. The president himself also had his say in an opinion piece in the same edition. 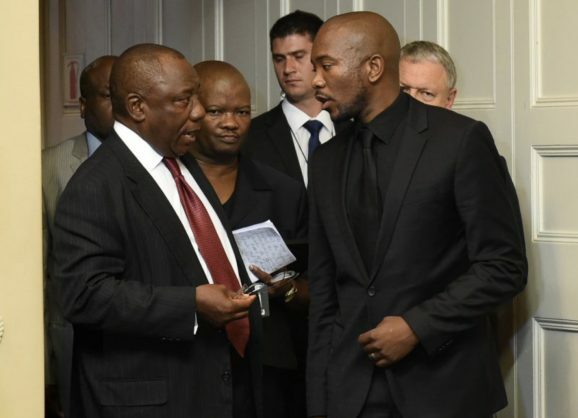 While Maimane finds Ramaphosa’s promises unrealistic, the president says he is “determined to stay the course of reform and renewal, undaunted by the difficulties we have yet to overcome”. Contrary to what Maimane says about the government’s record, Ramaphosa believes “significant progress towards the realisation of a country in which all South Africans are able to live in dignity” has been achieved. DA leader Mmusi Maimane each year delivers his own “alternative state of the nation address”, an annual opportunity for the DA leader to play president and campaign for his party. The gist of his message, this year, as summarised on the DA’s website where you can read the speech in its entirety, is that “South Africa doesn’t need a new driver. It needs a new bus”. “The ANC is a broken bus – dangerous and unroadworthy – hurtling down the road with all of us on board. What they now have in Cyril Ramaphosa is just another driver of the same doomed bus,” Maimane said. Later, Maimane – sticking to the analogy – said that under Ramaphosa, South Africa “would still find ourselves hurtling down the road in the wrong direction. That’s why we don’t need a new driver of the old bus. We need to switch buses”. The DA leader didn’t just compare South Africa to a bus, though; he also brought up “our neighbours north of the Limpopo” – Zimbabwe. Maimane recently met with members of the country’s opposition, the MDC. “Their harrowing stories of the brutal clampdown by Mnangagwa’s government on the people of Zimbabwe were hard to listen to,” Maimane said. The main lesson the DA leader believes we need to learn from Zimbabwe is that it is “extremely naïve to place blind faith in a new leader of a failed governing party”. “Zimbabweans are fast discovering that Zanu-PF is still Zanu-PF, with or without Robert Mugabe,” he continued.